The Human Design System is a science that is based on our genetic imprint. By understanding your unique design, you are discovering the owner's manual to your vehicle. Living out your uniqueness helps you to make good decisions that will reduce resistance as you move through life. By understanding your talents, tendencies, and needs in surprising detail, you gain an understanding of where to focus your energy and how to make decisions that bring you what you’ve always wanted. Most importantly, you begin to wake up to your true nature. Human Design helps you to truly recognize that there is nothing wrong with you and you can take the blame out of any relationship or situation. Human Design explains the mechanics that are operating behind the scenes. If you are on a quest to know your self, experimenting with the simple pillars of living your design begins a process of cellular transformation and deep deconditioning. Does that sound like something you'd like to dive into? What makes Human Design Unique? One significant element that makes Human Design so unique in terms of how it can help us, is that it shows us where we are succeptible to conditioning from others. No matter how far we’ve progressed in life, we all have “openness” where energies come in to us and because we have no way of recognizing where the pressure comes from, our minds assume an overcompensating behavior to deal with these pressures. Unaware of these patterns, we can be operating from a “not-self” behavior that constantly creates resistance, despite our good intentions. What we’ve often been treating as a problem and trying to fix our whole lives, really was never a problem in the first place and just requires an awareness to turn our focus to our true selves. Human Design is a no-fault system. By putting our mechanics into context, we can take any blame off others and ourselves for what may be a correct facet of our experience. Defined Splenic, Sacral and Root Centers and defined channels that are connecting them. What is your true self? 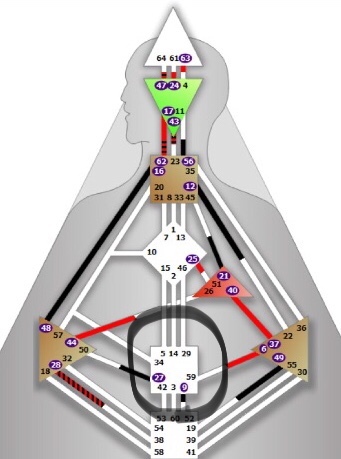 Human Design shows us that each of us has specific centers and channels, as well as many sub-layers that make up our own unique Type. There are an infinite number of possibilities that make up each individual in existence. By learning how to read the owner’s manual for your vehicle, you can actually take a back seat and enjoy the ride. A Foundation Reading with a Certified Human Design Analyst, such as myself, is the very best place to start. An analyst will be able to guide you through your body graph and show you what is important for you to focus upon. There is a lot of information floating around about Human Design, but unless you properly understand how to integrate it into your life, it can be cryptic or even dangerous. Starting with a Foundation Reading is the beginning place to launch off with your Human Design experiment. Click here to find out more about all the readings and services available to you. After experimenting with your Design after your Foundation Reading, there are many other ways to explore and go deeper into your self-study of your Human Design. You can look deeper into your purpose in an Incarnation Cross reading, understand significant transits in life that we all go through (Saturn Return, Uranus Opposition, or Chiron Return, partnership or relationship analysis to understand interpersonal dynamics, and lots of other specified areas to hone in on. Peter is a Certified Human Design Analyst and Guide from theInternational Human Design School and Human design America. Click here to for peter’s bio and chart.